Cox was a running back in college who gained 1298 yards from scrimmage in three varsity seasons and scored five touchdowns. He was a future draft choice of both the Cleveland Browns of the NFL (eighth round) and New York Titans of the AFL (28th round) in 1961. 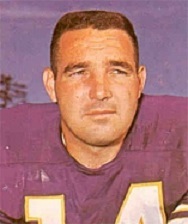 Signing with the Browns in ’62, he suffered a back injury during his first training camp and concentrated on placekicking, learning technique from veteran PK Lou Groza. The Browns traded him to Minnesota during the preseason, but he was waived in favor of Mike Mercer, who could both punt and placekick. Cox sat out the year but was invited back in 1963 and made 12 of 24 field goals and all 39 extra point attempts as a placekicker and also handled the punting, averaging 38.7 yards. He was relieved of the punting in ’64 and had a better year placekicking, hitting on 21 of 33 of his field goal tries and 40 of 42 PATs. Vikings went 7-7 to finish fifth in the NFL Western Conference. Cox continued on for a total of 15 seasons, all with the Vikings. After two lesser years in 1966 and ’67, his field goal percentage improved to 65.5 in 1968. He topped the NFL in field goals (26), field goal percentage (70.3), and scoring (121 points) in 1969, when he also received All-NFL honors from the Associated Press and Sporting News, and again in field goals (30) and scoring (125 points) in ’70, when he received consensus All-NFC recognition. His field goal totals dropped with the moving of the goal posts to the back of the end zone in 1974, although he succeeded on 13 of 17 attempts in ’75 for a career-high 76.5 percentage, and he became less reliable on extra points in his last few seasons. Overall, Cox was successful on 282 of 455 field goal tries (62 %) and added 519 extra points out of 539 attempts for a total of 1365 points, all franchise best totals. In 18 postseason games, he was successful on 11 of 18 field goal attempts and 38 of 40 PATs for another 71 points. Cox was a first-team All-NFL selection once and was named to one Pro Bowl. He also gained some notoriety as the inventor of the Nerf football.